Brighton & Hove’s daily paper The Argus was very excited about Koru Architect’s PassivPod and its unique ‘space age designs’. 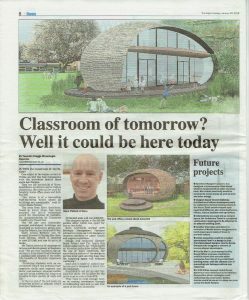 The paper dedicated a full page to our latest project, PassivPod, and its potential use as the classroom of the future. PassivPod’s Technical Director (and Director of Koru Architects) Mark Pellant said his vision was of a low-carbon high-wellbeing future where all buildings are sustainable.